Monte Vista and Steele Canyon battle underneath on Friday night. SPRING VALLEY – It was a challenging game for all those involved at Steele Canyon High on Friday night. From the players involved in the important Grossmont Valley League contest between the Monte Vista Monarchs and host Cougars, to the coaches, officials, and time and scorekeepers, it was a struggle just to get through four long quarters to a game with far less flow than your average league rumble. Steele Canyon and Monte Vista go for a loose ball on Friday night. 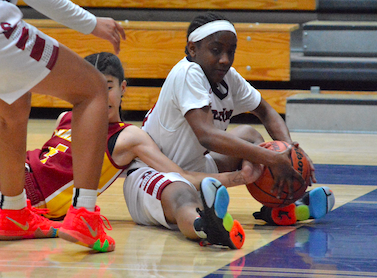 By the time it was over, the Monarchs had claimed a 57-50 win to move into second place past Steele Canyon, and the fouls had claimed many of the Cougars, who finished the game with just three players on the floor. Monte Vista (4-2 GVL) led 21-20 at halftime but did some great work in the third quarter behind the driving baskets and inside-out footwork by senior SARA TAHA. 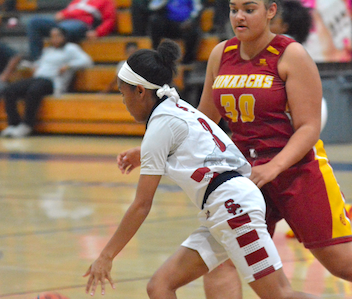 When the Cougars’ press didn’t stop the Monarchs in the backcourt, usually due to a foul, Taha, was able to outrun her opponents to the goal several times, making layups high off the glass, or drawing contact on her shot. Taha had 32 points in the contest and could’ve had more if not for a 4-for-11 mark on the free throw line in the fourth quarter. Monte Vista eventually assumed a 50-36 lead early in the fourth quarter. Monte Vista’s MARIAH MOORE defends Steele Canyon’s LALA WADLEY. Interestingly, the Cougars were actually able to close the deficit once they were short-handed on the floor, which started midway through the fourth. MAHKAYLAH CLINE had 11 points in the first half for Steele Canyon. Taha had 10 points in the first half for Monte Vista. 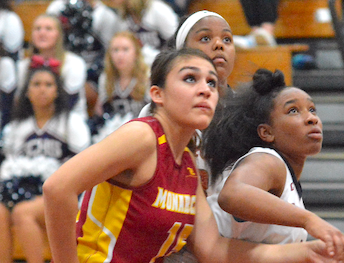 Freshman MEADOW DELINO was stellar from the foul line for Monte Vista, making eight-of-nine in the second half to finish with 14 points for the game. Monte Vista has a big home game next Tuesday against Santana at 6. The darker side of the game. The dark side of the game.